Even after World Tuberculosis Day, Cordaid continues to emphasize the need to boost the global campaign to end TB. “It remains the leading infection disease in the world. In DR Congo the TB epidemic is alarming. An increasing number of TB cases prove to be drug resistant”, says Jean Lambert Mandjo, who coordinates the Cordaid HIV and TB Project in DR Congo. In 2018 alone nearly 170.000 TB cases were detected in DR Congo. This makes up for the second-worst TB situation on the African continent. develop more effective methods to report TB and integrate them in national health programs. In conjunction with the National Tuberculosis Program and with generous support from the Global Fund, Cordaid and its partners are actively detecting and screening cases of tuberculosis. “We do this throughout the vast territory of DR Congo”, says Jean Lambert Mandjo, “in the urban as well as the most isolated rural communities. But also in prisons and other high-risk locations. Finding and treating patients, and leaving no one behind is our leitmotif. In addition, we plan to expand access to quality treatment for all TB patients”, he continues. 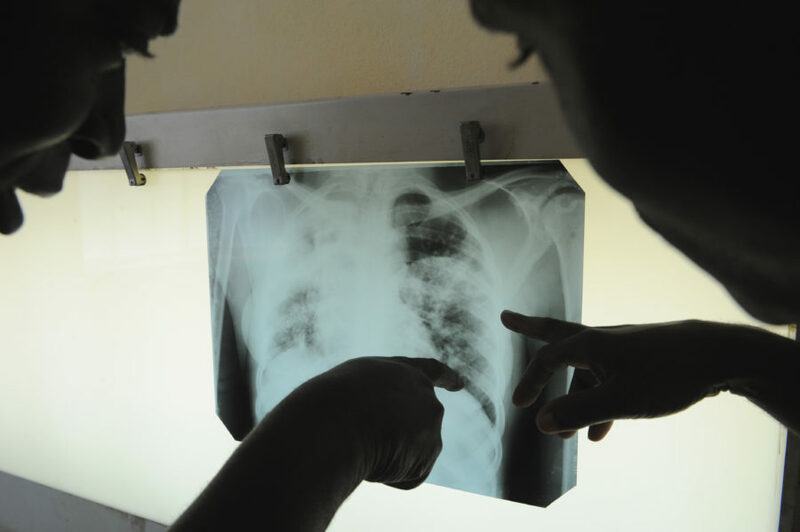 In the first 4 days alone, medical staff took 464 X-rays and revealed 143 new TB cases. 2 of them proved to be multi-drug resistant TB cases. Drug-resistant tuberculosis is a serious public health problem in DR Congo. In 2018, 770 people contracted a form of tuberculosis resistant to at least Rifampicin – the most effective first-line TB drug. The overwhelming majority of these people had multidrug-resistant tuberculosis, which is resistant to both Rifampicin and Isoniazid, another essential first-line anti-TB drug. Under-reporting and under-diagnosis of TB cases pose serious threats as well. According to WHO estimates, the DRC is expected to report 322 TB cases per 100,000 population. Yet in 2018 it has reported 188 per 100,000 inhabitants. This means an approximate 60% of people who have tuberculosis have not been reported and diagnosed. And under-detection among children is far greater than among adults. In 2018, tuberculosis prevention and treatment in low- and middle-income countries was underfunded by 3.5 billion USD. To globally increase detection, diagnosis and treatment of TB, the Global Fund, WHO and the Stop TB Partnership launched the FIND. TREAT. ALL. #ENDTB-campaign in May 2018. The aim is to reach 40 million people with TB with quality treatment in the next 5 years. In DR Congo, Cordaid’s efforts are geared towards this aim. Given the challenges, Mandjo calls for more international support and funding. “Globally, there is more political will and awareness to end TB. But countries need to move faster. They urgently need to increase national and international funding to fight the disease. Especially address the alarming increase of drug-resistant TB and reporting gaps. If we don’t step up our efforts, we will not end TB by 2030, which is the global target of Sustainable Development Goal 3. In 2018, tuberculosis prevention and treatment in low- and middle-income countries was underfunded by 3.5 billion USD. Without extra funding¸ the funding gap will increase in 2020. On top of that, additional funding is needed to accelerate the development of new vaccines, diagnostics and medicines. The Global Fund to fight AIDS, Tuberculosis and Malaria is the world’s leading partnership organization designed to accelerate the end of the three epidemics. In 2018 it invested 5.089.205 USD in 2018 for the fight against tuberculosis.